Family Business United ('FBU') is an unparalleled rallying point and voice for the global family business community and an invaluable source of insight into the sector. FBU is a resource for all, family businesses of all sizes and sectors, and their advisers, helping to raise the profile of the family business sector. Sharing news and best practice is at the core of what we are all about, as well as undertaking research projects, hosting twitter chats and webinars and putting on innovative events too. 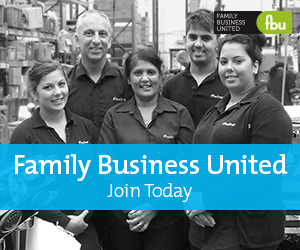 We are incredibly active on social media so follow us @familybizpaul on twitter and be part of the community. We have an established membership and work with them closely to promote their news and celebrate their success and put on educational events, publish ebulletins and give family firms a voice. At FBU, everything we do is about the family business, creating the best resource available to help families in business get access to the resources they need to continue their family business journey, wherever it will take them.